We have a full range of fixings available to compliment your signs. 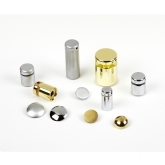 Standard screws and cover caps come in a variety of sizes and can be supplied with either a dome or flat headed cap, both come in Polished brass, Polished Steel and Satin Steel. We can also supply white, black, and brown plastic caps. Support fixings or Stand off fixings are an alternative method of attaching a sign or nameplate to a wall giving a more contemporary look. The fixing is made up of 3 parts for easy installation and the plate can easily be interchanged as one part is perminately screwed to the wall therefore only the caps need to be unscrewed to alter the sign. When these types of fixings are used the sign or nameplate will stand proud of the wall by around 15 - 50mm depending on the type chose, the most popular size is 15mm. Support fixings come in a range of colours and finishes, polished chrome, polished brass, satin silver, matt aluminium and black.